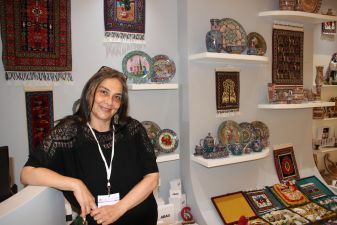 ABAD implements a number of projects in the area of decorative and applied folk arts and support to family businesses. Our own project started in 2016; the first store was opened in 2017. Today we own nine shops, and some of these shops are located in the regions of Azerbaijan. For us, this is important as we attach great importance to the development of regional craftsmanship. There are a lot of talented people in Azerbaijan who do not have the opportunity to offer their products to the market. Our goal is not just to find them - we motivate and inspire folk craftsmen, offer new ideas for specific products and their colour range. For this, we periodically host master classes. To this end, they opened a school in Guba, where they study the art of jewellery, carpet weaving and beadwork. We are waiting for the opening of the Sheki Ceramic Centre. We worked with great enthusiasm to display our products at the Gift & Promo Fair 2018! It was difficult to exhibit all the works of art by our numerous masters, among whom there are a considerable number of disabled people. At our stand, exclusive and popular samples of applied arts are exhibited. All our products are united by national ornaments of the Azerbaijani art. It is with great pride that we showcase household items, musical instruments, author's carpets, copper and ceramic dishes, wood products and dolls, which all reflect Azerbaijani miniature art.